4.2 out of 5 based on 16 bloggers and 2 commenters. 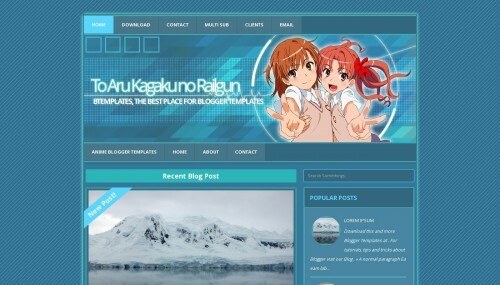 To Aru Kagaku no Railgun is a free premium blogger template with 2 columns, responsive design, right sidebar, fresh look, an exclusive design for Blogger, footer columns, social bookmarking icons, posts thumbnails, drop down menu, breadcrumbs, a background pattern, related posts support, well designed threaded comments, cute design and girly looking. Excellent template for blogs about anime, to write a diary, education or internet. Please in using your template for my blog, how to i change the banner image and also how do i post into the various Menu? About the menu, check out the template settings, there you can see the menu structure.